Among the recent happenings at Primrose this spring were improvements we made to our French kitchen garden, which included the addition of beautiful new, raised beds for our herbs, vegetables, and flowers. In addition to having the practical application of allowing our cooks to prepare meals using our own fresh, hand-picked vegetables, we hope that by rejuvenating this little garden, our residents and their families will also enjoy using the space. We purposefully designed the garden to facilitate outdoor interactions in a place that also stimulates the senses. Whether it’s the feel of a loved one’s hand, the smell of herbs, the gentle sounds of the wind chimes, the sight of flowers in all their colorful glory, or perhaps just the taste of a sweet cherry tomato right off the vine, we think this garden has a lot to offer our residents. As a place to visit, or explore, or spend quiet time in alone, a garden is important to people with dementia and Alzheimer’s disease. The presence of plants and flowers can have a healing effect, stimulate reminiscing, and provide peace and quiet to help to ease stress, anxiety, agitation, and pain. The communion between humans and nature is deep rooted. Informally we know gardens connect us to nature. Scientific evidence too, as published in the Journal of the American Medical Directors Association and documented by more than a dozen studies, shows that gardens have positive effects on the physical and mental well-being of people with dementia. 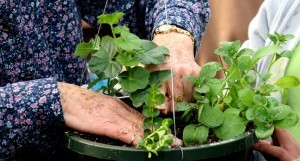 Encourages physical activity: A garden allows dementia patients to experience the outdoors safely. In this friendly space they can sit, walk, eat, play a game, or talk with their families and caregivers and feel unrestrained. Stimulates the senses: Dementia patients can interact with natural elements that excite the senses: colorful flowers; familiar fragrances; a calming breeze carrying the sound of wind chimes. These elements bring comfort and trigger memory recall for dementia patients, who may relive a distant memory of when they were growing up or another connection with their life before being in a care home. Soothe the soul: Dementia brings fear, anxiety, and sometimes depression. Spending time in a garden can relieve frightening anxieties and agitations, such as pacing, by helping to bring about feelings of peacefulness. There is some evidence that engagement in the garden can improve dementia symptoms without the need for medication. At Primrose, the kitchen garden is designed as a meaningful resource for our residents and accommodates different needs. Within the garden they can socialize with others if they want to, be alone if they want to be, and feel at home. 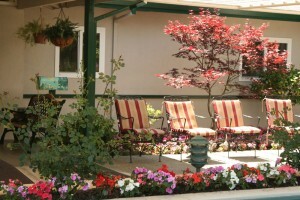 The garden provides structure, purpose, and pleasure for our residents and improves their quality of life. If you are starting a new garden, involve your loved one as early as possible in design, selection of favorite plants, and planting placement. Engaging someone with dementia helps them to reminisce about experiences growing and picking flowers, or growing, cooking, and eating vegetables. 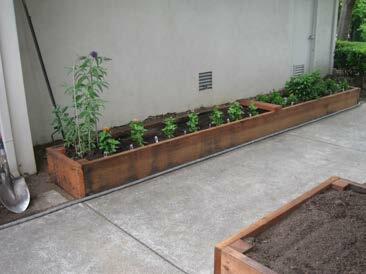 Add raised planting beds as they also provide seating areas if your loved one has mobility problems or is unable to bend. The seating allows a person to be closer to the plants to see or smell them more easily, and pull weeds, water, and perform other gardening tasks. Think about the scents and colors of plants and how stimulating or relaxing they are for your loved one. Consider the route your loved one might take and ensure pathways and walking areas are level non-slip surfaces. Add markers or wayfinders that make it obvious which way they should go, such as flower pots or containers, or other prominent features to help them to find their way. Foster moments of independence by adding rails along pathways and beside steps and ramps and be sure they become familiar with the garden by walking beside them or wheeling them around the paths. Make sure any furniture is comfortable and easy to get in and out of, and include seating areas that provide protection from the sun and allow for visitors as well as for individual time. Create paths that lead your loved one around the garden and not toward a gate or exit point. 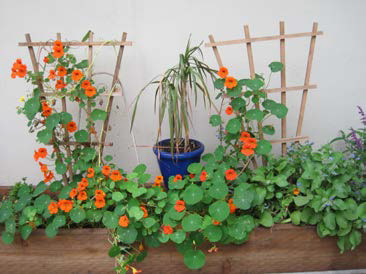 Ensure everything you plant is non toxic to allow for touching plants or even eating plants. Some plants can also cause skin irritation or create rashes as a side-effect of medication. Add water features, ponds, and fountains as they can stimulating and provide opportunities for people to put their hands into water, but carefully consider water depth and placement away from pathways. Gardens also provide opportunities for therapeutic activities such as sowing seeds or planting starters and pruning and harvesting fruits and vegetables. For cognitive exercises, they provide a conversation starter for you to point out plants and discuss their names, colors, and seasonal growth. You can also try getting your loved one to taste edible plants and touch and feel soft petals. And there are obvious benefits such as exercise from walking in a garden and watering and caring for plants, and just being outdoors getting a bit of vitamin D from the sun. If you start a garden project, let us know how it is going and contact Primrose if you have any questions about an existing garden and how to make it safe and enjoyable for your loved one with dementia or Alzheimer’s disease.